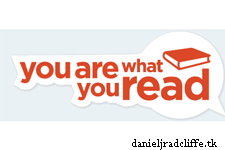 Daniel Radcliffe listed 5 books for Scholastic's You Are What You Read campaign. I recognize The Master and Margarita from the Read campaign. "I think the Old Man and Sea was probably the first book by a really classic author that I ever read, and it was then that I realized that things were classics for a reason, and they weren’t all just really, really, really hard work." "Germinal by Emile Zola was the first sort of longer and more European novel that I ever read, and I remember reading it in like five days. It’s a long book, and I’m a slow reader, but I just did nothing else." "It was given to me on my 15th birthday by a friend, and I just thought it was the funniest thing I ever read and kind of amazing and captured the period of time brilliantly." "The Master and Margarita is my favorite, favorite book in the world ever by Mikhail. To me it’s the greatest exploration of the human imagination, and it’s about forgiveness and life and history, and it’s just the most incredible book that I’ve ever read; I read it once and then I read it almost immediately again." "I think it’s fair to say that if we’re talking about the five books that have most influenced my life, I think it would be pretty churlish of me not to say Harry Potter and the Philosopher’s Stone for giving me everything that I have and everything that I will have."